So things have been busy, which has slowed my posting here. But the good news is that Carla and I are married! We tied the knot last week in the Outer Banks with lots of family and friends. It was a wonderful time and I feel like we really put our personal stamp on the event. Take the cake, for example. Neither Carla or myself are cake fans. Every year as a child, I told my Mom that I wanted an Angel food cake for my birthday. Most cakes just seem so dry and bland, or coated in a thick, saccharine paste of icing. Personally, pie has everything cake doesn't. It's sweet, tart, crispy, gooey, delicious, and fruity. But pies cannot be stacked. Well, except for pork pies, but Carla veto'd that. But then we saw a tiered "wedding cake" of Cypress Grove chevre cheeses at the NY Fancy Food show! It was perfect. Humboldt Fog is one of our favorite cheeses, made out of soft-ripened goat cheese coated in layers of ash. 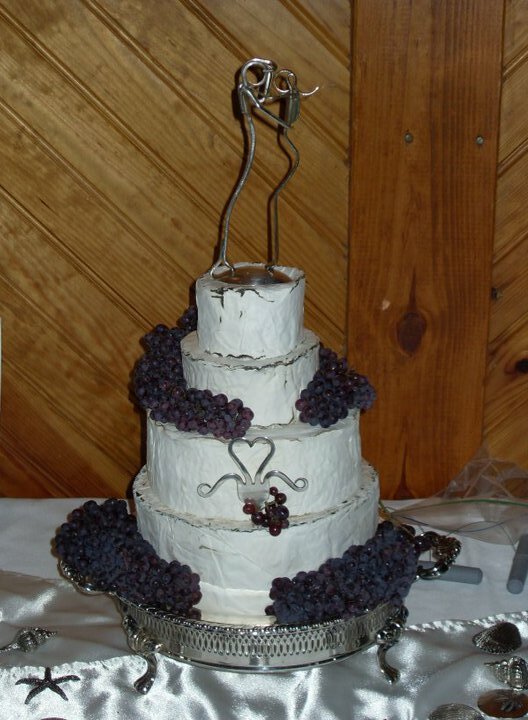 Plus, the white blooming rind makes it look surprisingly close to a traditional wedding cake. The actual tiers were made out of a 5 lb base of Humboldt Fog, then a 3 lb wheel of Truffle Tremor (goat cheese infused with ground black truffle), topped with a 1 lb wheel of Humboldt Fog, and finally crowned with a demure 8 oz Fog Lights. While the truffle-infused Truffle Tremor was a bit of a show-stopper, I loved the opportunity to share Humboldt Fog with all of our guests. We sliced it just like a cake and served large wedges for each table on acacia boards with honey and chocolate-covered strawberries. Oh yeah, the cake topper is a bride and groom made out of bent forks. I could not think of a more perfect cake for the two of you. It turned out fabulous, and was just one of the original things you did at the wedding. I can't remember how many times I heard someone say "That is the first time I saw that done at a wedding"